A recent study by an international certification body found that how well solar panels stand up to wear and tear varies greatly, but where they're manufactured has little to do with quality. The report, the PVEL-GTM PV Module Reliability Scorecard was published by Norway-based DNV GL. The tests, performed by PV Evolution Labs (PVEL), included five test categories. The number of photovoltaic module manufacturers taking part varied from 17 to 22, depending on the test. The modules were tested to determine how their solar conversion efficiency stood up to varying degrees of stress. Solar cell "efficiency" refers to the proportion of energy from sunlight that can be converted via photovoltaics into electricity. On average, today's solar panels have a 15% to 18% solar efficiency rate (the best PVs have as high as a 22% conversion rate). So, each solar panel would be tested based on its beginning efficiency rating. Solar panels produced by Kyocera Corp. were one of two top-performing products, according to the study. The five test categories in the 2016 Scorecard cover each of the major sources of performance degradation over the lifespan of a solar module — repeated Thermal Cycling, Dynamic Mechanical Load Stress, Humidity-Freeze conditions, Damp Heat Exposure and Potential-Induced Degradation. From 55% to 60% of the top performing modules were manufactured in China, according to the study. "This demonstrates that manufacturing location is not a good proxy for reliability," the study stated. The researchers cautioned that their tests results should be taken with a grain of salt, stating that "there is no truer test of a solar module's reliability than real-world conditions." 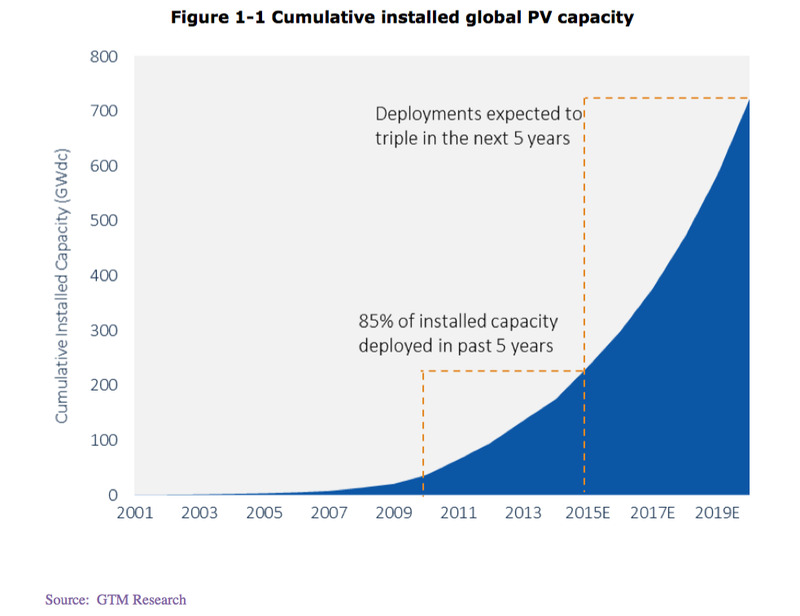 But, as 85% of the 234GW (a gigawatt is a billion watts) of installed global PV capacity has been in the field for less than five years, it will be more than 20 more years before actual field data can be gathered, the report stated. 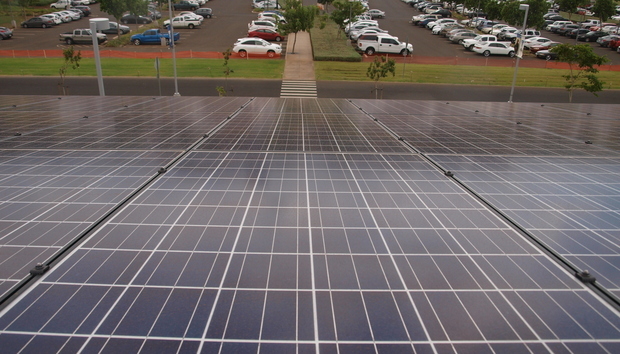 Overall, "many PV modules performed well across all tests," according to the report. 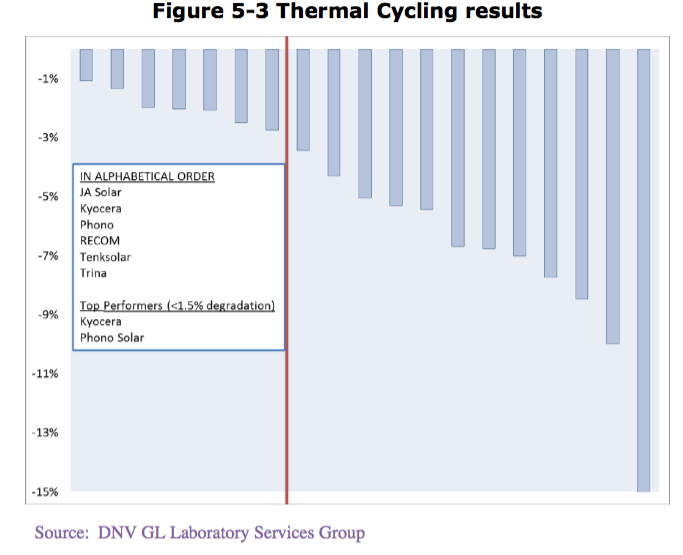 For example, eight manufacturers' products degraded less than 3% in solar conversion efficiency after undergoing the Thermal Cycling test four times. However, 19 companies participated in the Thermal Cycling test with efficiency degradation rates varying from 1% to 35%. 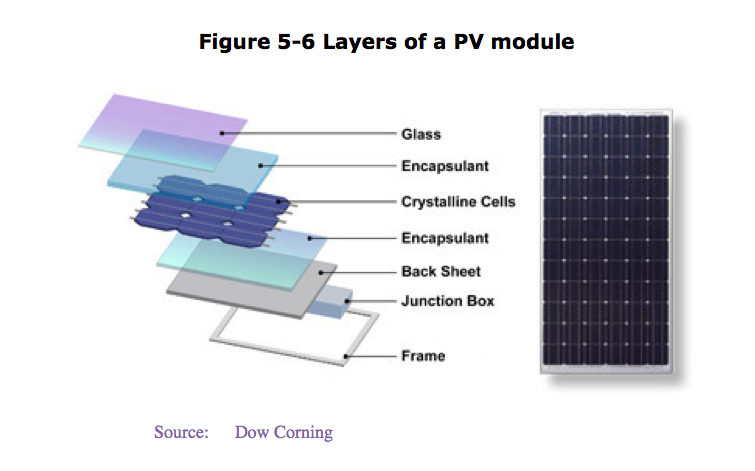 The various layers of a PV module. The Thermal Cycling test consists of modules that are heated from 40° Celsius to 85° Celsius. When the temperature rises above 25° Celsius, the maximum power current is injected into the modules, causing localized heating if solder joints are degrading. Four of seven of the top performing modules were manufactured in China. Phono Solar (produced in Nanjing, China) and Kyocera Corp. (based in China but produced in Tijuana, Mexico) were the top performing manufacturers, with less than 1.5% degradation. Other top performing modules were produced in Taiwan. The Damp Heat test also produced varying results. Modules were held at a constant temperature of 85° Celsius and a relative humidity of 85% for 1,000 hours (about 42 days). Twenty-one companies participated in the Damp Heat Test, with degradation rates varying from 0.6% to 58.8%. Six out of 10 of the top performing modules were Chinese-produced. The other top modules were produced in Mexico, Taiwan and Singapore. Another test that produced wide-ranging results was the Potential Induced Degradation (PID) test, where a 1kV (kilovolt or 1,000 volts) is applied in damp heat testing conditions for 100 hours. The test provides the temperature and moisture conditions necessary to stimulate increased leakage of electrical currents. Twenty-two companies participated in the PID test, with degradation rates varying from 0% to -58.3%. Seven of the 13 top performing modules were Chinese-produced. The remaining top performing modules were produced in Mexico, Taiwan, Singapore and Poland. One of the reasons for the study, DNV GL stated, is that the dramatic drop in module pricing, which helped catapult adoption, introduced quality concerns. Solar photovoltaic (PV) module costs have plummeted 75% since the end of 2009. "The PVEL-GTM PV Module Reliability Scorecard aims to address this critical problem. With its supplier specific performance analysis, the Scorecard can help investors and developers generate quality-backed procurement strategies to ensure long-term project viability," DNV GL stated. Typically, a 20% decline in PV module efficiency is considered a failure, according to the U.S. National Renewable Energy Laboratory (NREL). But there is no consensus on the definition of failure, because a high-efficiency module degraded by 50% may still have a higher efficiency than a non-degraded module from a less efficient technology. The current standard 25-year warranty is typically triggered if modules degrade more than 3% within the first year and at a linear rate down to 80% of its original power-rationg in year 25, according to GTM Research. Most solar installers build into contracts an expected photovoltaic efficiency degradation rate that typically doesn't exceed 20% over the contract's term. For example, SolarCity, the largest residential solar installer in the U.S., guarantees that its panel efficiency won't degrade below an 80% efficiency rating over a 20-year power purchase agreement (PPA) contract. A PPA is similar to a lease, but you pay a pre-determined gradient price per kilowatt of solar-generated power that you use over a fixed period of time - typically 20 years. Two-thirds of the world's solar capacity was installed within the past five years. Solar installations are forecast to quadruple by the end of the decade, growing to 528.1GW by the end of 2020, according to GTM Research. "Solar continues to grow in popularity, but it's crucial to select equipment that performs successfully over the long term," Jenya Meydbray, vice president of Strategy and Development at DNV GL, said in a statement. "Developing an understanding of how modules perform as they age in the field will highlight technology risks and enable the implementation of an effective procurement quality assurance strategy."